The powerful Microprocessor contained within the HAT520 ATS controller allows for precision voltage(2-way 3-phase/single phase) measuring and make accurate judgment on abnormal voltage (power lost, over/under voltage, over/under frequency, loss of phase, phase sequence wrong) and control ATS to tranfer after the delay has expired. This controller is suitable for NO Breaking ATS. When 1# is abnormal, the controller will send signal to start genset after the "1# abnormal delay" has expired. "Three remote"(remote control, remote measurement and remote communication) function can be implemented with the help of LINK communication port. 2.Over/under voltage, loss of phase, phase sequence wrong, over/under frequency protection function. As default, phase sequence wrong protection and over/under frequency protection are disable; however, users can set the protection function as need. 3.Parameters can be set via PC software using SG72 module (USB to LINK) or other converse module. 4.The voltage normal delay of 1# or 2#can be set in (0~60) seconds and the Genset start delay can be set in (0~3600) seconds. 5.The voltage abnormal delay of 1# or 2#can be set in (0~60) seconds and the Genset stop delay can be set in (0~3600) seconds. 6.“1# power priority”, “Auto/Manual”, “No priority” and “2#power priority” can be set via controller front panel. 7.Closing output signal can be set as on intervals or as continuous output. 8.Applicable for 2 isolated neutral line. 9.Auto/Manual mode. In manual mode, ATS transfer can be implemented via panel pushbutton. 10.LEDs mounted on front panel can clearly show ATS running status. 11.The output contactor capacity of 1# and 2#power supply transfer relay (1#CLOSE, 2#CLOSE) is 16A AC250V, volts-free contact, can be directly used in driving switch to transfer. 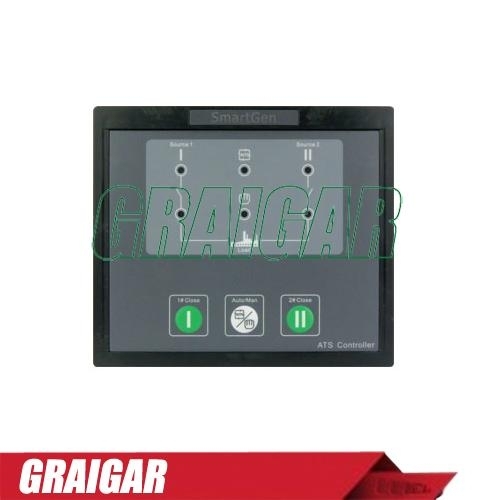 12.The output contactor capacity of Genset start relay (GENS START) is 7A AC250V/7A DC28V, volts-free N/C contact. 13.Suitable for various AC systems (3 phase 4-wires, 2-phase 3-wires and single-phase 2-wire). 14.Controller has strong ability of anti-electromagnetic interference, can be used under complex electromagnetic interference environment. 15.Modular design, self extinguishing ABS plastic shell, pluggable terminal, built-in mounting，compact structure with easy installation. AC170V~277V during AC power L1N1/L2N2 supply.